"Here comes the Bride" from Lohengrin. Richard Wagner 1813 Special Jubilee Edition. Hermann-Spielwaren, Coburg, Germany have created a very exclusive, limited edition collectible bear for the Richard Wagner Jubilee. This is a beautiful Hermann-Spielwaren Mohair Teddy Bear with a Musical movement that plays the "Bridal Chorus - Here comes the Bride". 38 cm = 15 inches tall. This lovely collectors' piece is made of rich high-grade German mohair, fully jointed, with excelsior filling. Hermann Spielwaren create beautiful Mohair teddy bears in Coburg, Germany in the traditional style. 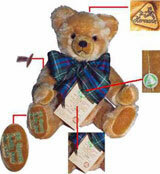 Hermann Spielwaren has produced teddy bears for the world for three generations. Collectible teddy bear, made of Mohair, fully jointed. Made in Germany. Commemorative 1813 MUSICAL Wagner Jubilee Lohengrin. Richard Wagner (1813 - 2013). MUSICAL Bear- plays "Here comes the Bride" from Lohengrin.